From May to October, temperatures range from 70° to 105° F in the day and from 45° to 75° F at night. Brief afternoon thunderstorms are common in July and August. Winters are mild in Zion Canyon with temperatures often reaching above 40° F. Little snow falls in Zion Canyon, but snow accumulates on the plateaus. Spring and fall are ideal times to visit the park. During these seasons temperatures range from 45° at night to 80° F in the day. Spring weather is very unpredictable. Stormy wet days are common, but warm, sunny weather may occur as well. Precipitation peaks in Mar. Spring wildflowers bloom from Apr through Jun, peaking in May. Sharp changes in weather occur within the park due to the rugged topography and range of elevations. Seasonal snowfall averages 13 feet but much heavier snows accumulate in high mountain areas. Summer days are hot, but mountain breezes keep evenings cool especially in lower elevation areas. Visitors should be prepared for a wide range of weather conditions. Temperatures vary with changes in elevation, and day/night temperatures may differ by over 30° F.
Fall days are usually clear and mild; nights are often cool. Autumn color displays begin in September in the high country (Cedar Breaks, Lava Point). 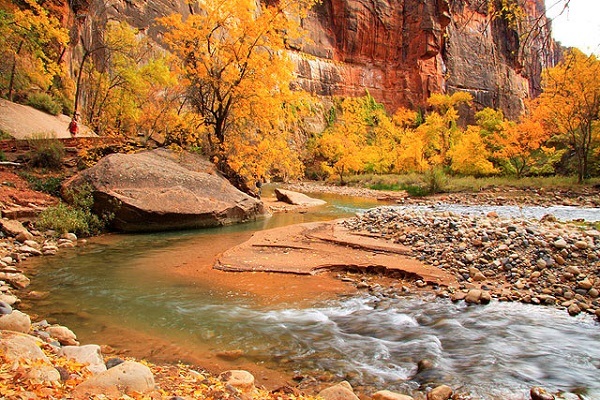 Colors in Zion Canyon usually peak in late October. The Zion Mt Carmel highway and Zion Canyon Scenic Drive are open in winter, but travelers should be prepared for hazardous driving conditions during and immediately following storms. The Kolob Canyons Road (off I-15 south of Cedar City) is plowed but may be temporally closed during storms or snow plowing. The Kolob Terrace (to Lava Point and Kolob Reservoir) is generally closed by snow about 20 miles north of Virgin, Utah. Kolob Canyon trails are often quite snowy. Snow depths can vary from one to several feet of snow, requiring snowshoes for easier travel. Avalanches often pour down the steep canyon walls during and shortly after snowstorms. Falling ice and snow when rising temperatures cause melting, are also hazards back country hikers and skiers may encounter.